Aquasun presents the E500, the 4.6m Endless Pools Fitness System, that provides the perfect opportunity for at-home, fitness workouts. The E500 features the Endless Pools swim current, giving you the most effective swim current available on the market. Whatever your swimming capabilities, whether you’re an Olympian or an amateur, the smooth current lets you swim easily in place. The deep current also adds resistance to a range of aquatic exercises for added core engagement. Our optional underwater treadmill lets you walk, jog or run in water’s low-impact environment. Aquatic exercises burn just as many calories as if you were on dry land, but without the negative impact to muscles that’s associated with dry-land activities. The E500 Endless Pool is perfect for anyone who has joint pain or muscular injuries. Post-workout, unwind with an incredibly soothing hydromassage. Each carefully designed seat has a unique configuration of jets that can be easily adjusted for the ultimate in total-body relaxation. The durable, steel-framed cabinet has sleek, modern styling that comes in dark mocha or grey oak. 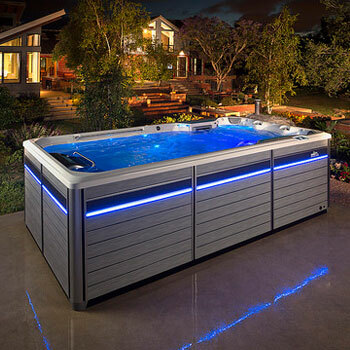 The swim spa is virtually maintenance-free and is incredibly versatile. Choose a deeper model for chest-deep aquatic exercise or add an underwater treadmill to vary your workout. You can build your own pool to suit your specific needs.